They’re Coming to Take you Away……….hey, hey! Christians throughout the world are so blessed to be living in this day and age as the fulfillment of Bible prophecy is almost a weekly occurrence. Perhaps the most obvious is the evolving of the One World Government. 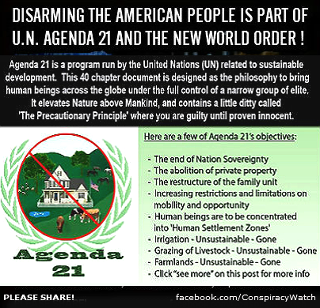 The United Nation Globalists are fervently infiltrating the communities of the world with their Agenda 21. Using the environment as their banner of sorts, the Green Machine is imposing upon the unsuspecting citizenry, the tentacles of control which will ultimately nullify any and all freedoms guaranteed us by the United States Constitution. Their goal is to replace our Bill of Rights with their “Declaration of Human Rights” for the ‘common good’ of mankind. Through their Sustainable human settlement development, they are in the process of implementing within our communities a piece of legislation designed as a blank check to abolish private property. This will be accomplished through the seemingly honorable effort to save the environment. Government Communities will be designated for the elderly, the indigenous, disabled and even women. In case you do not think that you fit into one of these categories, guess again. Mentally handicapped are considered to be disabled, especially if you are one of those Bible believing fanatics who will be deemed not capable of making sound decisions for the common good of mankind. For those folk who will take a stand against their tyrannical agenda, the political regime of the United Nations has at it disposal armed troops that will be most persuasive in convincing the ‘rebellious’ troublemakers to submit to their doctrine or face the consequences. These troops with their blue Berets will become a common sight in the streets of America and the World. 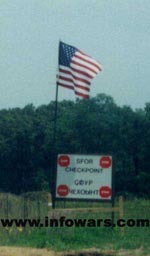 What may not be so conspicuous is the already established “concentration Camps” which will be the relocation center of those who refuse to become a part of the One World Order. Yes, religious persecution is on the horizon. Folks, our hope is built on nothing less than Jesus’ Blood and Righteousness. As we enter into this most perilous time in the history of mankind we need to hold fast to the truth that God is in control and He is still on the Throne. It is imperative that we saturate ourselves with scripture and become educated in the affairs of this World. We need to keep our heads out of the proverbial sand and become informed, then involve ourselves in stemming the tide of wickedness in whatever way the Lord leads. Lastly, we need to intercede at the throne of Grace that the evolving World Government will be hindered from rapidly destroying our inherent God given rights of life, liberty and the pursuit of happiness. In the near future I plan to post sequels to the Agenda 21. In the meantime I encourage my readers to search the internet and become knowledgeable in this sinister endeavor that is proliferating our society.